Are you aware that Florida law prevent teens under 18 from obtaining an abortion unless they involve a parent or go to court? No such requirement exists for young women who wish to continue a pregnancy to parent or who are making an adoption plan. Yet anti-abortion politicians are trying to impose even more stringent requirements on the more than 25,000 Florida teens who become pregnant each year. Senator Kelli Stargel (R-Lakeland) and Representative Erin Grall (R-Vero Beach) have filed bills that would require a teen’s parent to consent before she could get an abortion. 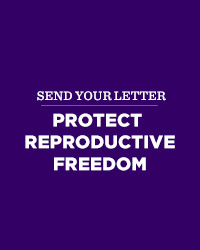 Please make your voice heard by sending a quick letter to your state representative and state senator today, letting them know that teens already have enough government imposed barriers in accessing abortion care. The bills being pushed by Stargel (Senate Bill 1774) and Grall (House Bill 1335) will require a clinic or physician to obtain the consent of a parent before the teen's abortion can happen. Teens already are more likely than older women to have later abortions, and requiring a girl’s health care provider to acquire written permission will only cause further delays. After enactment of Missouri's parental consent law, for example, the proportion of second-trimester abortions among minors increased by 17%.1 While abortion is safer than childbirth, later abortions entail more medical risks and are more difficult to obtain because they are more expensive and fewer doctors perform them. 1AGI calculations based on data from Vicky Howell Pierson, "Missouri's Parental Consent Law and Teen Pregnancy Outcomes," 22 Women and Health 47, 53 (1995).